In this post, I will do a walk-through tutorial on setting up the Uniform Server, show you some of its features, and show how you can easily setup WordPress development sites. 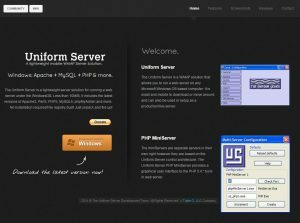 I have been using the Uniform Server package on my Windows machine for local PHP programming and for running WordPress development sites. 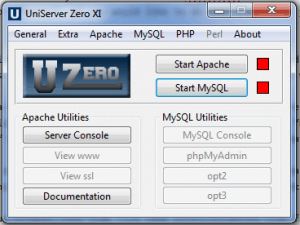 The Uniform Server is a “WAMP” package, meaning that it is a Windows package that includes Apache, MySQL, and PHP. In this regards, it is similar to XAMPP or WAMP, but I find that it is simpler to setup and use. By default, you set it up to run as a “portable app”, meaning that it does not have to be “installed”. In fact, the installer just unzips the program into a folder. Let’s get started. The project home page is located at http://www.uniformserver.com/. Notice on the top of the screen are links to the community forum and to the wiki. I found that the wiki has a good article about installation, but not much else. The forum is moderately trafficked, but I have been able to find the answers to my questions using the search functionality. Also, notice the big “Download” button. Clicking on that takes you to Source Forge, where the code for the project is hosted. I’ve highlighted the link to the download, which is in the middle of the page. Go ahead and download the file. The installer executable is going to unzip the programs into a folder called “UniServerZ”. It will by default offer to put that folder in your download directory, but change the path to the location where you would like the program to live. If you have a place where you keep your development work then you may want to type in a path to that location. Again, it is a portable program, so you can put it in a location that is convenient. You will need to occasionally navigate to it, so don’t make it too hard to get to. Go ahead and extract it and you will get a folder on your C drive called “UniServerZ”. I don’t particularly find “UniServerZ “ to be a very friendly name and usually change the top level directory name to something like “Sites” or “Server”. If you would like to do that then after you unzip the archive, go to the location where you put it and rename the folder. For this tutorial, we will assume you named it “Sites”. Go to the “Sites” folder and open it. You will see a folder named “www”. This is a place where your sites can go. Double click on the “www” folder to open it. You see a few files and folders there but ignore them. Instead, right click on a clear space in the “www” folder and choose “New” and then “Folder”, to make a new folder. Call it “phptest”. The folder “phptest”, along with any other folders you create here, can contain an entire website or PHP project. You should see the PHP info page from the file we created earlier. Yeah! OK, now let’s install WordPress. 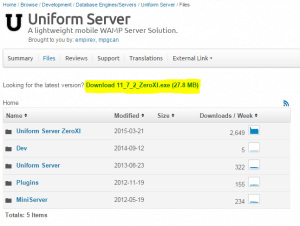 Go to http://wordpress.org and download a zip file of the latest version. In Windows, you can double click on the zip file to open it. Inside you will find a folder named “WordPress”. Copy that folder and paste it into the “C:\Sites\www\” directory. Now, rename the folder from “WordPress” to something like “mysite”, or whatever you want to call the folder, but do yourself a favor and make the folder name lower case with no spaces or special characters. Now, back to the Uniform Server control panel. Click the “U” on your task bar. If you get a message that the program is already running then look in your system tray by clicking on that little up arrow. When you get the control panel open, you will see a button for phpMyAdmin. 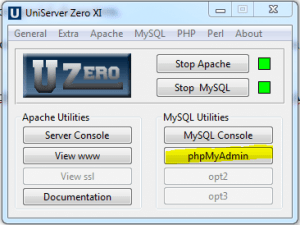 Click on that to open up the phpMyAdmin program, which is what you can use to create a database for your local WordPress site. On the left side of the screen, click the “New” link to create a new database. Fill in the name of the database. For our example, I named it “mysitedb”. There is also the option to select the “collation”. I usually select “utf_unicode_ci” but you can select whatever is appropriate for your site. Go ahead and click the “Create” button. Now that you have created your database, select it from the list of databases on the right. After you have selected the database you should see a “Privileges” menu item in the middle of the screen at the top. Click on that next. Enter the name for your MySQL database admin user. In our example, I entered “mysiteadmin”. From the “Host” drop down (2nd line), select “Local”. Now, you can type in a password or click the “Generate” button to have the program create a random one for you. Copy that password into a Notepad file or other place. You will need that when installing WordPress. You can leave everything else at its default and scroll down to the bottom of the page and click the “Go” button to create your user. Now we are ready to run the WordPress install. Point your browser to http://localhost/mysite and you should see a screen to install WordPress. Go ahead through the install wizard. 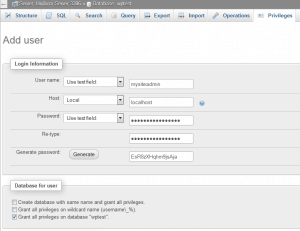 Enter your database information, including the password that you saved and go to the next screen. Enter the name for your site “My Site” and your username, password, and email address. Since this is a test site, you can uncheck the box to allow search engines to index the site. Now, log in to your WordPress website. You should be all set now for working on your WordPress projects. Thanks for this tutorial. I’m new to WAMP, WordPress, and Uniform Server Zero, but this was extremely clear in helping me get things up and running with a minimum of hassle. I contacted you a while ago ref installing Uniform which is a doddle after using wamp. Still using it. Yesterday evening and most of today I tried transferring a wpress site to hostgator using the duplicator plugin with zero success. I eventually sussed it (no thanks to hostgator). I’m pretty sure it’s because the version of mysql in Uniform is 5.6+ and the hostgator version is an ancient 5.5 version on their shared hosting. Therefore wordpress used a 4 byte set as opposed to a 3 byte set within the database within Uniform which isn’t compatable with the old 3 byte set on hostgator. As I’ve only got 2 months left with hostgator I’ve shifted to SiteGround which is a different experience altogether from the first mysql enquiry to signing up and beyond. As an addendum, hostgator obviously wants us to upgrade to a non shared plan as later versions of sql are used on these. Congrats on figuring out the issue. That kind of thing can be hard to track down. I’ve been happy with SiteGround also.